Alice is learning fast now. At school, she now plays with the other kids. 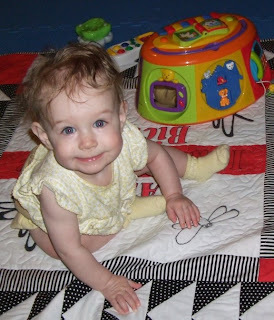 In the morning when I drop her off, I sit her down on the play mat with the other kids and leave her playing. Although I tell her bye-bye and give her a kiss, she is so involved with watching the other kids and reaching for that days tub of toys, she doesn't even know I've left. I stop at the closed door outside her room, and watch her for a second or two before leaving for work. 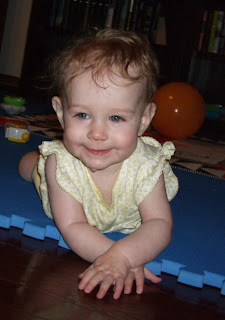 This past week, she has begun the "army crawl". When she decides she wants to get something that is now out of reach, she will lean over, lay down on her tummy, and start skooching across the floor. Alice is very proud of this recent accomplishment. She will raise up on her arms and beam a broad smile. Alice can also pull up onto her knees...and with a little help - all the way up to standing. Oh my gosh!! I've got to get there to see this. How fun.